To celebrate Lafayette’s 125th anniversary of the town’s incorporation in 1889, the City of Lafayette decided in late 2014 to rename Gough Avenue to Couch Avenue. The decision was based on Frank Miller’s 1968 statement that his grandmother, Mary Miller, originally named it Couch Avenue — not Gough Avenue — for the town’s first doctor, James H. Couch. Street listings in late 1890s Boulder County city directories also show Lafayette addresses for both Couch Avenue and Gough Avenue. J.H. Couch, who died in 1901, was a highly regarded member of the Lafayette community, was among the town’s first trustees and served on the town board from 1889 until his death in 1901. John B. Gough (pronounced “Goff”) was a world renowned and fiery temperance speaker. 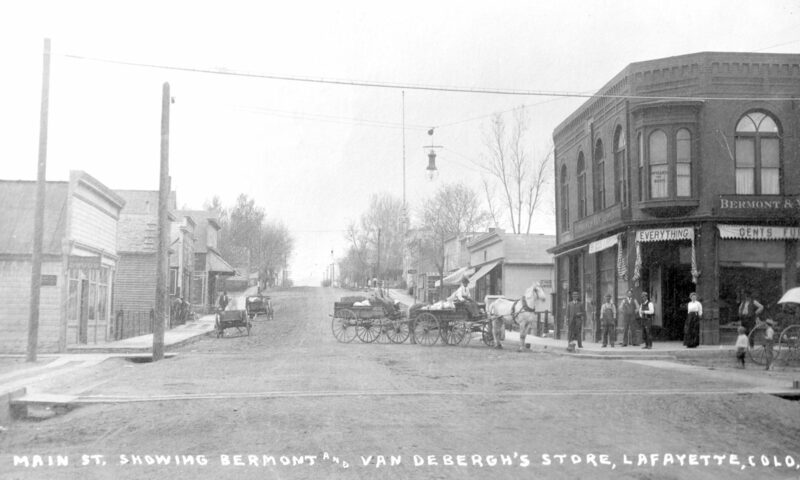 Mary Miller was known for her temperance beliefs, including deed restrictions placed on property she sold in most of Old Town that prohibited the sale or distribution of liquor. In early 2015, the city changed the street name back to Gough Avenue. Approximately 30 maps that originally belonged to the Rocky Mountain Fuel Company were given to Lafayette librarian Effie Amicarella in the mid-1970s by Gerald (Jerry) Armstrong who at the time was president of Rocky Mountain Fuel Company. Contained in the RM Fuel map collection is the 1888 Lafayette townsite plat map, which is defining, indisputable evidence that town founder Mary Miller selected “Gough” and not “Couch” as one of the town’s original north-south avenues. 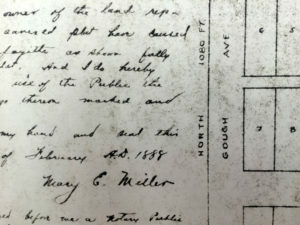 The 1888 platting document, a document that Mary Miller would have spent years assembling and refining, shows that she intended the street to be named Gough because she signed her name about an inch from where the street was labeled. Two other maps from the Lafayette Miner’s Museum (dated 1900) and at least three other RM Fuel town maps made before 1912 corroborate the 1888 platting document. All other typographical or cartographical mistakes related to Gough Avenue made after the 1888 platting document are just that — errors. According to Beth Hutchison, Mary Miller named the street after John B. Gough (1817-1886), a well-known temperance leader. The originals of most of the RM Fuel maps in the Lafayette Library are at the University of Wyoming in Laramie. Jerry Armstrong tried to give the originals to School of Mines and to CU-Boulder but neither would take them. A similar collection of Superior and Louisville-area historical maps was given to my mother, Carolyn Conarroe, who was librarian at the Louisville Library in the 1970s. Two of the RM Fuel maps at our Lafayette Library, including the 1888 townsite map, are fairly small and were stuck on the inside bottom of the map case tubes. Because of this, previous researchers may have thought the 1888 townsite map was missing or lost. I had to remove the cardboard tubes from the case and jar the maps loose.